“We need to come up together and invest in our arts sector hence those involved should be serious and professional rather doing their events haphazardly,” was a statement shared and echoed by some of the local prominent sponsors at the just ended Zimbabwe Achievers Awards Gala dinner held at Maslow Hotel in Sandton.It is true that appreciating someone with an award is one thing but having a great event recognising those personalities, giving them the value they have in society is something else. Art lovers have often said if the arts sector is taken seriously it will develop into an industry and not only sustain livelihoods but also promote towards economic growth of the country as well. The ZAA South Africa lived up to its billing when it awarded Zimbabweans who are making it big in South Africa in various fields. These included ministers, celebrities, socialites, fashion bugs, philanthropists, musicians, actors and businesspeople who all came together under one roof to partake in the festivities of the day. The glitz and glamour, gala dinner -black tie event was held at prestigious hotel where patrons had to fork out anything from R680. Prolific comedian Carl Joshua Ncube was the master of ceremony who not only managed to wow the crowd with his jokes which were relevant for the Zimbabwean born South African celebrities but sailed through during five hour long programme. It was a long choreographed programme which accommodated dinner of three course meal and red carpet live interviews which was also co-hosted by Zimbabwean actor Evangelista Mwatse who is making her strides in the foreign land. Some of the personalities who passed through the red carpet affair were Isibaya actor Ernerst Ndlovu, Generations stars Luthuli Dlamini and Chichie Mhende, designer Ngugi Vere, Minister of Tourism and Hospitality Honorable Walter Mzembi and his wife Barbara, Steward Bank chief executive officer Dr Lance Mambondiani, millionaire and Reverend Frank Buyanga, actors Yvonne Katsande, and Kesiwe Farai Malindi Jr among others. Guests were entertained by songstress Hope Masike and Crimson Blu. Masike put up a scintillating performance as she dished out songs from her new and old albums. Songs like Majaira, Musha and Ndoitasei put the crowd into frenzy mood as they not only sang along but joined on the dancing floor. The award winner musician was backed by her bassist Elisha Herema. Speaking at the event, ZAA chairman and founder member Mr Conrad Mwanza said he was delighted to be hosting the third annual show in South Africa. “We had in mind an event where as a community-regardless of race, culture or political affiliation, we could come together in unity to find hope and to celebrate the wonderful and inspirational accomplishments of our fellow country men and women. Our aim is to create a platform where Zimbabwean talent and achievement could be highlighted and where people could be recognized while motivating fellow Zimbabweans to work with the same determination to reach excellence in everything they do,” he said. He challenged those back home to be big dreamers. Minister of Tourism and Hospitality Walter Mzembi said it was important to recognise friends and fellow members of the Zimbabwean community. “Your personal and professional milestones are helping to unfold a new era of Zimbabweans that are world leaders and innovators. “We are celebrating the people whose work we admire on whose teams we have laboured and whose achievements have helped renew our commitment in making Zimbabwe a better place,” he said. The star studded event was sponsored by Fastjet, Impala Car Rental, Hamilton Insurance, CMG International Media Group, Steward Bank and Food World among others. This year’s chairman’s honorary award (Friend of Zimbabwe award) was given to Thandie Modise. Modise is a South African politician and currently serving as chairperson of the National Council of provinces. 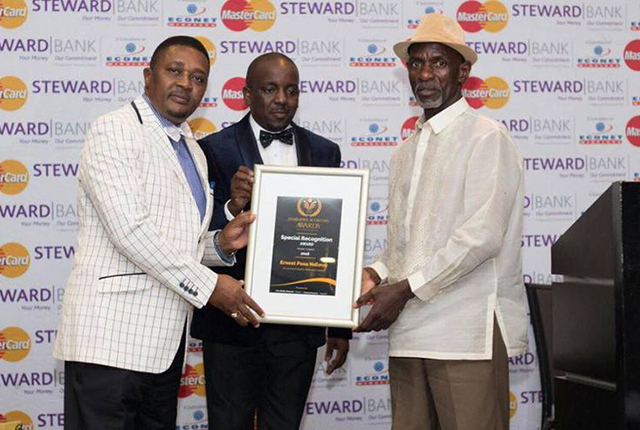 Some of the reputable personalities who received the Pioneer Legends Award include Jah Seed (Anesu Mupemi), Ernest Ndlovu, Esrom Nyandoro, Luthuli Dlamini and Peter Ndlovu.